Globally, Scandinavian countries have been leading in a lot of areas such as freedom of the press and social equality. Norway’s capital Oslo is now striving to become a big city example in green transformation and environmental protection. As far back as in June 2016, Oslo’s city council approved a strategy to reduce CO2 emissions by 50 % in 2020 and 95 % in 2030. To meet this target, it will employ measures such as “to phase out fossil fuel heating in homes and offices by 2020,” according to the Renewables 2017 Global Status Report. What role solar thermal can and will play in these ambitious plans seems to be the obvious question. But Glen Peters, Senior Researcher at the Centre for International Climate and Energy Policy, does not believe that the energy source will be of importance in the city’s green transformation. “I don’t think Oslo will be using solar thermal – or, at least, it will make very little use of it. Generally, fossil fuel heating should be replaced by either district heating from burning waste or hydropower and heat pumps, and similar sources,” Peters said when asked by solarthermalworld.org. In 2010, Oslo launched the FutureBuilt programme, mainly to implement its green transformation strategy (see the attached document). Fifty pilot projects – from individual houses and public buildings to entire city blocks – are to be set up by 2020. Their purpose is to show “that it is possible to design climate-neutral urban areas of great architectural quality.” But like Ihler, Birgit Rusten, Programme Manager of FutureBuilt, pointed out that solar thermal was not “an important element” of its sustainable building projects. 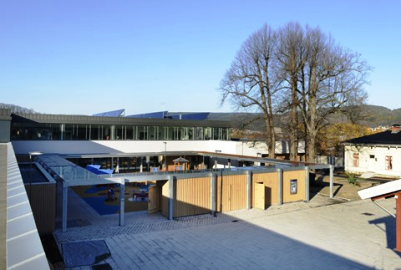 Until now, the FutureBuilt portfolio includes only four completed projects using solar thermal, the Frydenhaug School and the Holmen swimming pool among them. Frank Stier is a Sofia-based freelance journalist who works for print and online media and news agencies: www.socb.de.